I’m waiting for the paint to dry on this before I have another round with it. My fingers are itching to fix the all-to-neat alignment of the shoreline and sheep heads, but first the paint needs to dry. I also need to decide whether to add a cloud in the sky to cast the shadow on the distant hilltop, or lighten it. Plus all the other additions, tweaks, adjustments, not-yet-put-in-ideas bouncing around my head. 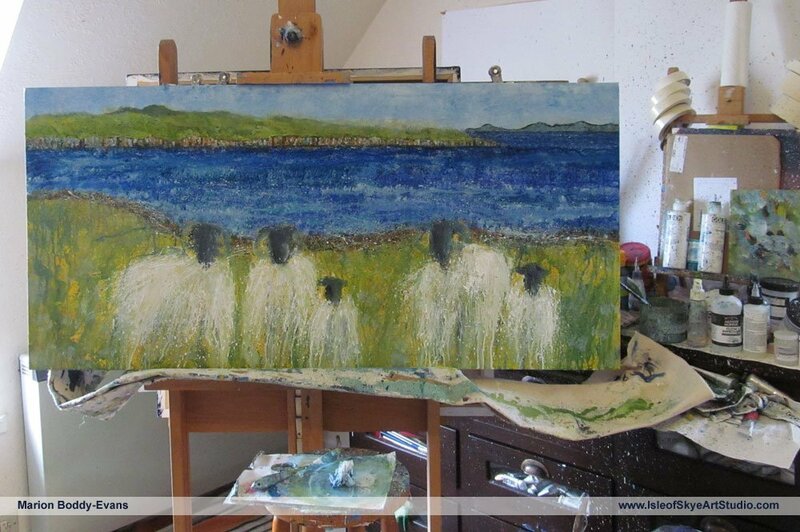 And deciding whether it’ll have daisies or buttercups in the foreground. Perhaps a few poppies for a splash of red? Are we there yet? Is it dry yet…? • Part 2: Are We There Yet?